1) Elbow macaroni or if you want to get fancy curly, wheels any type of macaroni is fine. 3) 2 cans of diced tomatoes of any type. I use plain or sometimes stewed. 4) 2 cups Shredded cheddar cheese. You can buy bulk and shred your own or buy it pre shredded finely shredded is the best. 5) Butter, salt and pepper. Preheat oven to 375 degrees for slow cooking or 450 degrees if you are in a hurry. The baking time is for melting the cheese and giving the dish a good browned top. Bring water to a boil and cook macaroni until done. 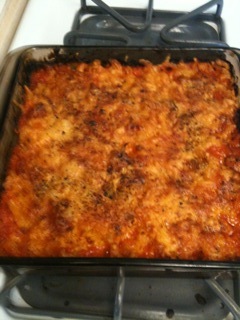 Put canned tomatoes and 1 1/2 cups of shredded cheese in baking dish. Drained cooked macaroni and rinse until cool. Mix macaroni in baking dish with tomatoes and cheese. Put remaining cheese on top of macaroni. Top mixture with 1/4 teaspoon of butter around in a square add salt and pepper to taste. Bake for approximately 30 to 45 minutes until cheese topping is brown. This is a dish that can be adjusted changed to suit your preference in taste and texture. There really is no way to mess it up.